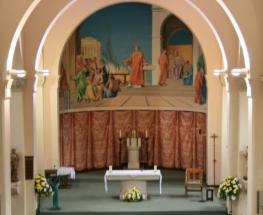 First Holy Communion - Welcome to St Lawrences Church in Feltham, Middlesex. Preparing to receive Reconciliation and the Eucharist for the first time can be one of the most memorable experiences parents share with their children. There is no fixed age when children receive these Sacraments: parents assess when they feel their child is ready. It is important that the family attend Mass every weekend so that the child will understand more fully what the Eucharist is about. Families who regularly worship at St Lawrence's are invited to enrol their children for the parish preparation for Reconciliation/Eucharist in June when they are in Year 3 or above. Parents play a major part in the preparation, which starts in September, and are guided through it with the help of monthly parents' meetings, guide books and children's workbooks. Catechists also lead the children in group activities once a month. When the children have worked on their particular chapter at home, they bring their books to Mass for the monthly Eucharistic Celebration and present them at the Offertory. The parish prays for these children throughout their sacramental preparation. Children receive the Sacrament of Reconciliation in Advent. They receive the Eucharist for the first time in springtime, in small groups at the Mass they regularly attend. Once all children have received the Eucharist there is a Thanksgiving Mass and a party.